June this year is undoubtedly a busy month for both technology companies and tech geeks. Following Computex Taipei 2014, WWDC Roundup and Google I/O 2014, Samsung Galaxy Premiere 2014 took place on 12th of June 2014 in New York. A new Galaxy tablet line dubbed "Galaxy Tab S", as rumored, was officially unveiled at the June 12 event: Samsung Galaxy Tab S 10.5 and Samsung Galaxy Tab S 8.4. These two tablets pair with a vividly colorful, razor-sharp screen and thin and light design and you no doubt will figure out that it's amazing to play DVD on Samsung Galaxy Tab S.
Samsung Galaxy Tab S comes in with ultra-thin, lightweight design and colorfully brilliant display, blowing the competition out of the water. Highlight 1: High-resolution Super AMOLED display. The stunning Super AMOLED display with 2,560 x 1,600 pixel resolutions, this combination arguably makes Samsung Galaxy Tab S the best tablet on the market. With four times the pixels of an HDTV, double of its previous series, the screen, by auto-adjusting brightness levels based on where and what you're viewing, also keeps everything clear, producing a big step forward in terms of image quality. Highlight 2: Thinnest and lightest large tablet. Samsung gadgets are always known for its thin, light and large screen, like Samsung Galaxy Tab 3, Galaxy S4, Samsung Galaxy S5 etc, and Samsung Galaxy Tab S goes even further. An ultra-thin build with a light design makes this tablet perfect for travel. It comes in two sizes, the smaller model will have an 8.4-inch display, while the larger a 10.5-inch screen. Both tablets are available in 16GB and 32GB versions. Highlight 3: Colorfully Brilliant Display. Almost all the people supposed, prior to the Galaxy Premiere 2014 event, that "Tab into Color" designated to the color of the tabs. Color is indeed the clue, but it's related to the display rather than itself. Samsung Galaxy Tab S offers more saturated colors, keeping whites looking cleaner and brighter and dark thicker, bringing better and more LCD-like viewing experience. Also, there are settings to tweak the color up and down. All those features make Samsung Galaxy Tab S a perfect tablet that will be worth serious consideration when it comes to some HD videos especially DVDs playback. 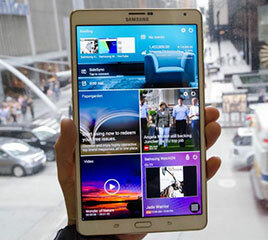 Tablets can never play DVDs directly, however, Samsung Galaxy Tab S is no exception. To play DVD on Samsung galaxy tab S, you need to change DVD to digital video formats for Samsung Galaxy Tab S 8.4 and 10.5 first. This can be easily done with a proper DVD ripper. 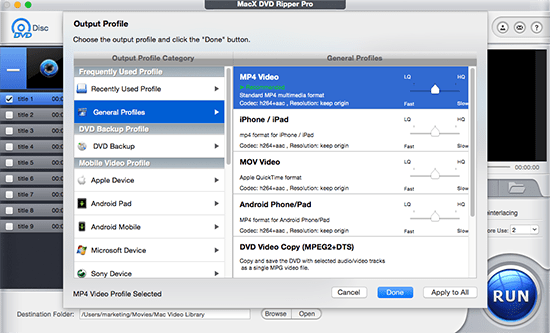 Here MacX DVD Ripper Pro is highly recommended. This DVD ripper for Galaxy Tab S can professionally rip DVD to Galaxy Tab S 10.5 and 8.4 and other Samsung series, including DVD to Samsung Galaxy Tab, Samsung Galaxy S7/S6/S5 etc with 36x speed and superb quality. What’s more, it is also capable to convert DVD to various video formats, like MP4, H.264, MOV, FLV, MPEG, M4V, AVI, WMV, MKV, etc for playback on various popular mobile gadgets such as iPod, iPad Mini 4, iPad Air/Pro, Apple TV/3, Android and many more. After download and install this DVD to Samsung Galaxy Tab S ripper on Mac, launch it. Click "DVD" to import the DVD you want to rip. To rip DVD to Samsung Galaxy Tab S supported format, you can directly choose "to Samsung Pad Video" from "Android Pad" in the list. Or you can just choose a specific Samsung Galaxy supported video format from the list. Finally, hit the bottom right "RUN" button to start DVD to Samsung Galaxy Tab S conversion on Mac. Tips: MacX MediaTrans can help you transfer DVD movie file to iPhone iPad etc. mobile devices in a fast speed without iTunes syncing. Notes: Another important reason to choose this DVD ripper lies in its ability to support the latest DVD copy protections like Sony ArccOS protection, DVD region codes, RCE, CSS and Disney X-project protection. This means you can rip any hottest DVD to Samsung Galaxy Tab S smoothly, such as DVD Maleficent, Transformers Age Of Extinction, How to Train Your Dragon 2 and other new DVD movie releases you like.